A popular joke in anti-Haftar circles is that his self-styled Libyan National Army is neither Libyan (since he has Sudanese and Chadian fighters), nor national, nor indeed is it an army [a play on the Holy Roman Empire, whihc was neither Holy, nor Roman, nor an Empire]. A coup plotter, a defeated soldier, a US-sponsored exiled fugitive, and now powerful rebel warlord Khalifa Haftar has had an ever-shifting position in Libya’s political landscape. Haftar, whose forces controlled parts of the country, said on 17 December 2017 he would listen to the “will of free Libyan people”, in the strongest indication so far that he might run in elections expected in 2018. He was popular among some Libyans in the east weary of the chaos but faces opposition from many in western Libya. Libya’s national army commander Khalifa Haftar announced on 17 December 2017 the end of the Libyan Political Agreement, which was signed in Skhirat in Morocco in 2015, and said he does not recognize any decisions issued by the political bodies linked to it. “The military institution will not submit to any party unless it has gained its legitimacy from the Libyan people,” Haftar said in a televised speech. "We now control 90% of Libya, we have 75000 soldiers and we can control Libya’s south, borders with Egypt and Tunisia.” Haftar told Jeune Afrique in January 2018. Haftar enjoyed long-standing support from key actors across the Arab peninsula including Egypt and the UAE which have made public statements reflecting their support of Haftar’s LNA, while being courted by Russian and EU officials. Haftar is backed by Egypt and Russia, but Washington under the Obama administration kept him at arm's length. By early 2017 there was growing concern in Europe that Washington might switch its support to strongman General Khalifa Haftar, who is based in the east of Libya – though Donald Trump had not signaled a change of policy. Under the Obama Administration, the US supported the the internationally recognized government in Tripoli, though it is said the CIA supported Haftar. France has been accused of providing military backing for Haftar. In July 2016, a French military helicopter crash near the eastern city of Benghazi killed three French soldiers and forced Paris to confirm, for the first time, that its special forces were operating in Libya. Libya's UN-backed government responded by saying that their presence was a "violation" of the nation's sovereignty. It said in a statement that it was "displeased with the French government's announcement". Khalifa at that point was making significant gains in his assault on Benghazi, the birthplace of the 2011 anti-Gaddafi uprising, and military analysts suspected it was largely due to logistical support from French special forces operating in Libya. A year later, when Haftar’s forces took Benghazi, Paris welcomed the advance. Frances’s shift towards supporting Haftar was mainly championed by the foreign minister in the new Emmanuel Macron government, Jean-Yves Le Drian, who also served as minister of defence from 2012 to 2017 in the government of previous president Francois Hollande. Haftar’s Muslim Brotherhood aversion mirrors those of the rulers of Egypt, Saudi Arabia and the UAE, countries that staunchly support the Libyan strongman. Haftar has forged close ties with a branch of Salafists, called Madkhalists, using their fighters and incorporating their conservative ideology in LNA-controlled parts of eastern Libya. Madkhalism is a strain of Salafism based on the teachings of Saudi cleric, Rabi al-Madkhali, who has written fatwas supporting Haftar. A fundamental tenet of the movement is to obey any prevailing Muslim leadership with unquestioning loyalty regardless of its track record, a doctrine particularly suited for Saudi Arabia’s ruling House of Saud. The Madkhalists do not participate in elections or democratic institutions, putting them at odds with the Muslim Brotherhood, fellow Islamists who endorse participatory democracy. Both Haftar and the Madkhalists are fiercely opposed to the Muslim Brotherhood, also known as the “Ikhwan” in Arabic. A spokesman for the Libyan National Army said 03 March 2019 the LNA had seized control of Libya's southern border with Algeria. The spokesman, Ahmed al-Mesmari, said Field Marshal Khalifa Hifter's troops entered several southern towns, including Ghat and Awaynat, the previous week. The advances were the latest in an operation Hifter announced in January 2019 to “eliminate gangs, Islamic State terrorists and criminals” in the south. The spokesman said Hifter's forces now control all Libya's borders except the one to the west. Alec Luhn and Dominic Nicholls, reported 3 March 2019 in the Telegraph that "Hundreds of mercenaries linked to Russian military intelligence have been backing the rebel commander of Libya's breakaway eastern half, The Telegraph has learned, as Moscow further expands its presence in Africa. The murky private military company Wagner Group has been supporting Khalifa Haftar with 300 personnel in Benghazi and has supplied his Libyan National Army with artillery, tanks, drones and ammunition, a Whitehall source said." The forces loyal to Haftar were better equipped than the forces described as "Libyan army," and Haftar forces also included their own air force. Combat helicopters belonging to this private air foce supported the bedraggled Libyan army in the fighting. 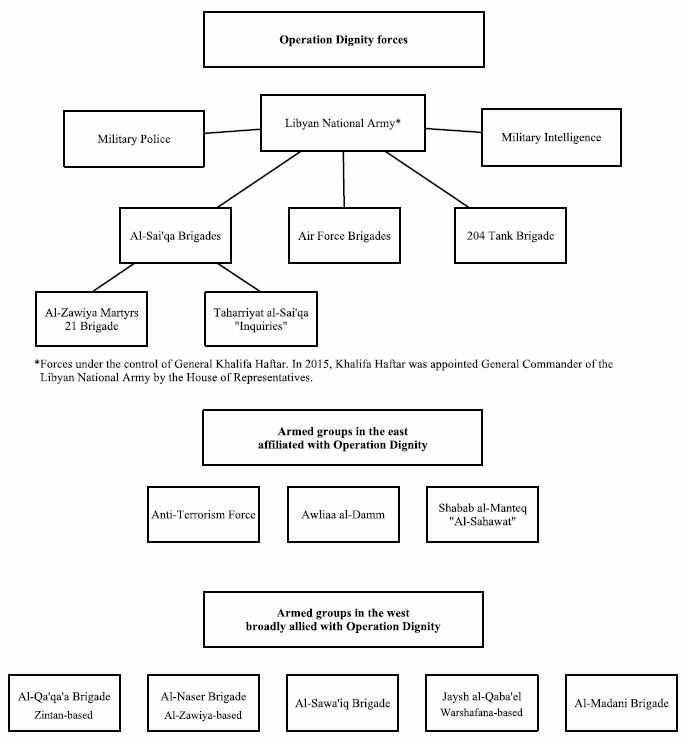 By May 2015 the LNA appears to have five MiG-21s supplied by Egypt. The aircraft seen in photographs show that at least some of these aircraft are MiG-21MFs - a type not previously been in service in Libya - and painted in a brown and yellow camouflage scheme close to one used on Egyptian MiG-21s than on Libyan ones. Recently released Google Earth satellite imagery showed five MiG-21s with this distinctive camouflage at Gamal Abdel Nasser Air Base 25 km south of Tobruk on 21 April. Meanwhile, the UAE supplied additional Mi-35 assault helicopters to the LNA in April 2015, according to the English language Libya Herald newspaper. Another vehicle produced in the UAE and/or Egypt and has been seen in LNA service is the Streit Typhoon 4x4 armoured personnel carriers. The Streit Group's main production facility is in Ras al-Khaimah in the UAE. In April 2016 UAE donated a number of Armored Personnel Carriers (APC) and military pick-up trucks to the UN backed Libyan government in Torbuk. The number of vehicles sent by the Gulf emirate is unknown, but a picture posted by the Libyan National Army (LNA) shows dozens of new Panthera T-6 light APCs and Toyota Landcruiser pick-up trucks. The Libya Arab News Agency (LANA) reported in 2015 that the LNA had received 900 of the Panthera T-6 vehicles. Together with Egypt and Jordan, the UAE defied the UN arms embargo on Libya to become one of the most consistent supporters of the LNA since 2012.